Major League Baseball is full of talented overpaid stars that get paid millions to throw a ball around for a living. In fact, every sport has overpaid players that frankly aren’t worth it. And one MLB star just landed the most monster contract in the history of sports. Remember the old days when baseball legends like Mickey Mantle were working class folks who entertained with humble salaries? Those days are gone. Every year, athletes make more and more because the market dictates their salaries. The irony is that all of them actually believe they’re underpaid while being tone deaf that people pay big money to see them in person and that’s the only reason why they make the millions. At least, that was the way of the past. But then, with the invention of television; advertisements, subscriptions,and endorsements made some of these athletes the richest people in America. And every year it goes up and up and up. Mike Trout is almost inarguably the best player in baseball. Actually, this isn’t a joke, analytically; Trout might be the best baseball player of all time. Sorry, Babe Ruth. And he just scored a record-breaking $430 million 12-year extension with the Los Angeles Angels. 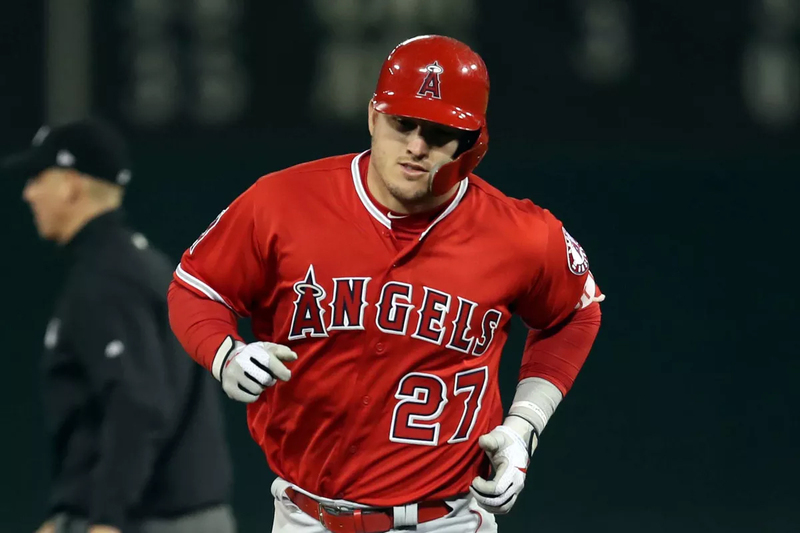 Trout, who has won two American League MVP awards and finished second four times, will receive an average of nearly $36 million a year, topping Zack Greinke’s previous record average of $34.4 million with the Arizona Diamondbacks. His contract laughably just squashed Bryce Harper’s “record-breaking” Philadelphia Phillies 13-year $330 million contract in less than a month. One year less and over a hundred million more speaks volumes about the kind of player he is. The irony being that most people think this contract is a bargain too. Trailed only Ty Cobb for WAR through age-25 season after 2017. If we extrapolate 2018, he will pass Cobb by the end of the season for the most WAR through age-26 season. Fifth player in MLB history to win two MVPs by age 25, joining Jimmie Foxx, Stan Musial, Mickey Mantle, and Johnny Bench. Three straight OPS+ titles. His career OPS+ of 174 ranks sixth all-time, with only one other player (Barry Bonds – 182) playing their full career in the integrated era. The BOAT [Best of all time], for me, simply has to have played post-1960. The advancements to the game are undeniable, and athletes today are just better than they have ever been before. That leaves two real challengers to Trout: Barry Bonds and Ken Griffey Jr.
Bonds has issues of his own, and even if we look at his career before those “issues” (as defenders of Bonds like myself tend to do), Trout has the clear edge. Same with Griffey. Even before the injuries came into play, Trout is clearly the superior player. Griffey doesn’t have nearly as much black ink on the card as one might imagine. He never led the league in OPS+, and he won only one slugging crown. His three WAR titles are impressive, but Trout already has five. And that’s just getting started. Hard not to acknowledge that as we evolve in sports that athletes will run faster, hit harder and be incredibly more athletic than those of the past. It’s pretty obvious. Zion Williamson isn’t just the next LeBron James; he might turn out to be better than him. What was interesting about this move too is that Trout grew up in the suburbs of Philadelphia and it was thought that he would join one of his best friends, Bryce Harper, at the Phillies. As in, that’s the whole reason why Harper went there in the first place. Also, the Angels just aren’t that good. This was a surprising move on Trout’s part but money always talks, doesn’t it?